Calculate how much Online Banking and Online Deposit can save you and the environment. "I do most of my banking via DCU Online Banking"
All the information I need to manage my accounts, evaluate rates, and pay my bills is available right here online, 24 hours a day. It's easy to find, easy to use, and reliable. I can even order my checks here. Thanks! The pace of life is faster than ever. Time is precious. You need easy access to your money wherever you are, 24 hours a day. Online Banking gives it to you. That's why more than 345,000 DCU members use it to manage their DCU accounts and loans every day. All you need is your member number and PIN (Personal Identification Number). View and access your primary accounts  The accounts under your personal membership. View and access your joint accounts  Account of another member on which you are a joint owner. With free eStatements, you can view, print, and save your monthly and quarterly statements for deposit and loan accounts, credit cards, and mortgages. You can view, print, and save front and back PDF format images of your cleared checks. Up to twelve months of images are available. Bill Payer – Save time and money by paying almost anyone using one time payments or setting up recurring payments. Billers you set up online can also be paid through Mobile Banking. Online Deposit – Deposit checks free with the camera on your smart phone or iPad, or the computer scanner. Credit Card Balance Transfer – Transfer balances from high rate credit and store cards and start saving immediately . CashEdge Funds Transfer – The easy way to move money between your DCU accounts and accounts at other financial institutions. Account Manager – Manage your Visa Rewards, update your personal information, report a lost/stolen card, request wire transfers, and more. Payment Center – Located within Account Manager, Payment Center is a convenient and secure way to move money into DCU and to make payments and transfers to your DCU Accounts. Online File Storage – Gives you a secure place to upload copies of your important document files for safekeeping. Access Online File Storage through Account Manager. Payment Center  A convenient and secure way to move money into DCU and to make payments and transfers to your DCU Accounts. Access your DCU accounts with smart phones, iPads, and internet-connected devices. Learn more about Mobile Banking. Online Help – Select Help or "?" as you begin a transaction and you'll see information specific to the page you are on. Online Support – Our eBranch support team answers virtually all emails we receive in 24 hours or less. Live Chat is also available from Online Banking during normal support hours. Telephone Support – For questions in regards to the Online Banking Service, please contact DCU's Electronic Services Department at 508.263.6700 or 800.328.8797. * To set up Member to Member Transfers, fill out a request form in Account Manager and these accounts will be added to your transfer list. Each time you complete a transfer, your DCU member number will be reflected on the recipient account statement for identification purposes. Everytime I log onto Online Banking, I can do everything I need to do on a daily basis: check my balance, pay bills, receive notifications, open new accounts if needed, etc. AND, it's FREE! Does it get any better than that in today's economy? NOTE: To view and print PDF files, you'll need Adobe Acrobat Reader, version 6.0 or later. Other PDF viewers may work, but we cannot guarantee the documents will display correctly. To view flash-based content, you'll need Adobe Flash Player. Online Banking is rated 3.4 out of 5 by 181. Rated 5 out of 5 by Caarm27 from Excellent customer service Every time I've had to contact DCU I've found them to be very professional. Rated 5 out of 5 by Maureen from Madeline is a super star!!!!!! I had a question about my DCU Platinum VISA card and a purchase that was over my credit limit. Madeline explained why I was having difficulty, presented me with a couple of options and completed my transaction within minutes. Problem solved! Rated 5 out of 5 by rkramer50 from DCU Online banking is EZ 2 Use I truly appreciate how extremely user-friendly online banking is. All the screens are pop-up friendly, easy to read & understand, and maneuver. Contact w/ Customer Service is always simple w/ replies almost immediately delivered. I've been a DCU patron for over 30 years. To say I'm totally pleased w/ DCU is an understatement. Thank you, DCU. Rated 5 out of 5 by Jae from I love using online banking This is best bank ever I would recommend to anyone. Rated 5 out of 5 by OAV from Everything in one place DCU online banking let's me keep DCU even though I haven't lived in New England for several years. It's easy to keep track of and pay off my Visa card, and I can transfer money to other DCU members with no problem. Rated 5 out of 5 by Jim from Excellent online access The online banking system is top notch. You can do almost anything you need to do 24/7 from the comfort of home. Rated 5 out of 5 by KEW from Excellent! DCU on line banking has all the features you could want! Several of my friends use other banks and their on line features - and when we compare, they don't have all the features and functionality that I have. Does Online Banking support Windows 10 (which is not listed)? How do I retrieve my Member Number? I am currently outside US, and have no access to any walk-in branch overseas. My address is also non-US, how can I get hold of my Member number? I have two questions; 1. I Manage 3 separate member accounts in my PC Branch, my account and my 2 college age daughters. In the old PC branch these were listed separately so I could see the total amounts each of us had, i.e. it had the total for savings, money market, checking, etc per member. In the new PC Branch all 3 accounts are lumped into one big account so now I have the running total for 9+ items . How do I separate these so they appear as three separate member accounts just like in the Old PC Branch? I want to see how much money each of my daughers have at a glance rather than having to do out the math. 2. I do not use Financeworks nor do I have any desire to use it ever. How do I delete it from the new PC Branch? Thank you DCU. 1. This is not possible to do in pc branch now, worker's credit union has a login page that will let you do what you want. perhaps you should open a small account with them and check it out. 2. Not possible - see answer 1.
so if internet explorer will not load and google chrome will not resolve a dns server error, there is no way to apply for a loan through dcu? If you are unable to apply for the desired loan online, you may apply by calling us at 800/328-8797 option 3 instead. can i pay a loan online? If you want to pay your DCU loan online, you can do so by transfer from your DCU accounts using PC Branch or Easy Touch, or by electronic transfer from another institution. To make your payments using PC Branch, visit our web site at www.dcu.org, log into PC Branch icon, and use the transfer option on the Transfers section. To make your payments using Easy Touch, please dial 800/328-8797 and follow the easy to use menu options. If you wish to use funds at another institution to pay your DCU Loan, you would need to move those funds to DCU first, either by mail or by transfer. DCU does have an online service that allows members to move funds between institutions. It's called CashEdge, and you can sign up for it in the Transfers section of PC Branch. Once you register for service, and add the accounts at your other institutions, you can move funds between your accounts. "DCU's Online Banking is excellent"
DCU's Online Banking as well as their customer service are excellent! Thanks for providing this excellent service when big banks have failed to take care of their customers!! 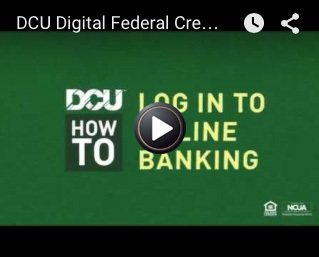 How to Log In to Online Banking for the First Time (video)  Instructions on how to access online banking, create a password and access all your online DCU accounts. How to Use Online Check Deposit with a Computer and Scanner (video)  Instructions on how to deposit a check to your account using a computer and a scanner. How to Reset a Forgotten Password (video)  Forgot your password? These instructions show you how to Use the Forgot Your Password tool. FinanceWorks  An easy to use tool designed to help you manage your everyday finances all from within Online Banking. Online File Storage  Free secure storage of your important online document files.